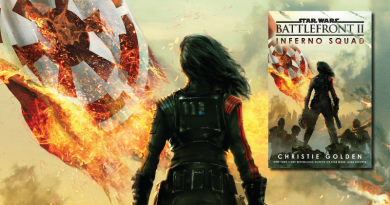 Out today, Star Wars: The Old Republic: Annihilation is another stand alone Star Wars action novel like Scourge or Mercy Kill. The central character is Theron Shan, the non-Force-sensitive secret son of the head of the Jedi Council, Satele Shan, a descendant of Revan. The story picks up a few years after the events of the Star Wars: The Old Republic MMO, when the Republic has essentially, though not completely, won the war with the Sith Empire. Dark Horse’s tie-in comic The Lost Suns, written by Alex Freed, Drew Karpyshyn’s successor as lead writer of Bioware’s MMO, is an enjoyable read and rounds out the characters. Watching Bioware’s trailers for SWTOR “Return” and “Hope” – in that order – might increase your enjoyment of Annihilation, as well. But none of them are necessary to Annihilation, and the books stands successfully on its own. If you like James Bond, Annihilation is for you. If you like fast, action oriented novels, Annihilation is for you. If you like The Old Republic era, Annihilation is for you. 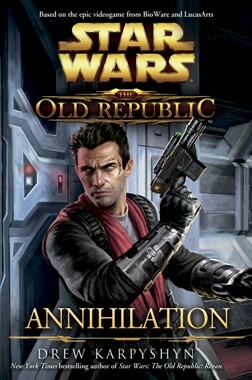 If you play SWTOR, Annihilation is for you. Check the Reviews pages for my complete review. For more insight on its author, Drew Karpyshyn, see my interview posted last week. Linda has been a Star Wars fan from the time she saw Episode IV in the theatre with her parents and insisted on being Han Solo while playing with the neighborhood kids. She’s now a fangirl who splits her time learning to twirl a bo staff like Ray Park, jumping horses, writing fanfic she dreams up on her commute to work, and spending time with her husband and their own feisty Padawan version of Ahsoka. “I wonder if she had been a male character if she would have made the same decision. ” Probably. This decision was more about Jedi than gender. 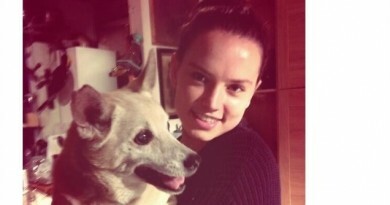 Theron never had anti-attachment training. I thought Satele would be more relevant to human beings in general if she weren’t head of the Jedi Order. Let’s also notice that the receptionist is there only to be flirted with. Annihilation is about family because characters related to Revan sell. I agree with you about Teff’ith. Otherwise, your review was well-written but I have to respectfully disagree with most points. A wise Jedi? A Jedi with family problems? 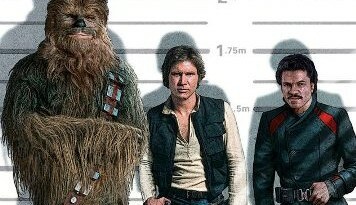 A snarky smuggler? A white male jack-of-all-trades hero? The nods to the OT were cute, but to me they just pointed out that this book didn’t do anything new. But good job, Linda. You made me think. It’s good to read a review that came from a different direction than mine.